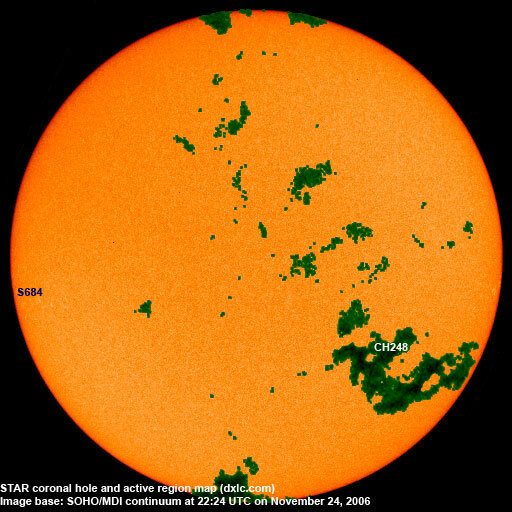 Last major update issued on November 25, 2006 at 06:00 UTC. The geomagnetic field was quiet to minor storm on November 24. Solar wind speed ranged between 472 and 618 km/s (all day average 560 km/s - increasing 138 km/s over the previous day) under the influence of a high speed stream from CH248. 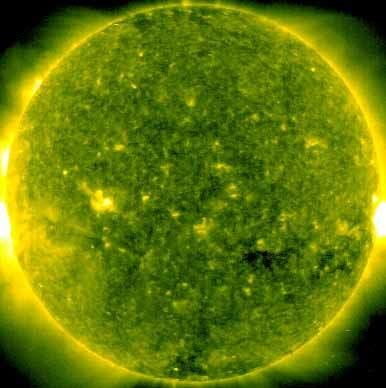 Solar flux measured at 20h UTC on 2.8 GHz was 77.4. The planetary A index was 21 (STAR Ap - based on the mean of three hour interval ap indices: 20.8). Three hour interval K indices: 35533222 (planetary), 34533222 (Boulder). [S684] A new region began to rotate into view at the southeast limb late on November 24. Location at midnight: S10E85. This region may be capable of C class flaring. November 22-24: No obvious partly or fully Earth directed CMEs were detected in LASCO imagery. A recurrent coronal hole, CH248, in the southern hemisphere was in an Earth facing position on November 19-23. Only the northernmost extensions, including a trans equatorial extension in the easternmost part of the coronal hole, were within potentially geoeffective positions. 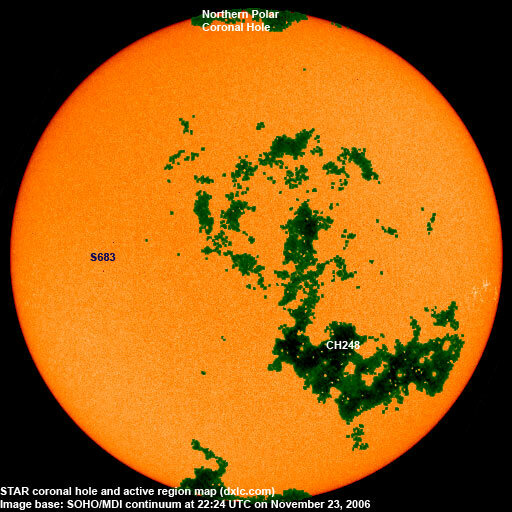 The geomagnetic field is expected to be quiet to active on November 25-26 due to effects from CH248, occasional minor storm intervals are possible. Mostly quiet conditions are likely on November 27-30. Long distance low and medium frequency (below 2 MHz) propagation along east-west paths over high and upper middle latitudes is poor. Propagation on long distance northeast-southwest paths is poor to fair. Monitoring remarks from a location near N58E06: At 03h UTC there were quite a few stations around. Signals from Newfoundland and Cuba were the strongest, with some stations form Venezuela and Colombia reaching fair to good signal levels. Another burst of geomagnetic activity had wiped out most of the stations by 04h UTC.